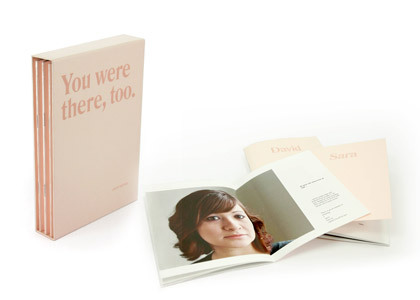 "You were there, too" is a three booklet set. Youngs uses photographic portraits and answers to “relationship defining questions” to create these individual depictions of his relationships with three close friends. Michigan native Davin Youngs lives, works and takes pictures in Chicago, IL. A graduate of the Oberlin Conservatory of Music, Youngs has shown work both locally, internationally and in various online and print publications. His work often deals with the nature of relationships and how they are visually represented through the medium of photography.